Jungle Net tries to make you believe that it is an application or rather “a set of free tools” that can enhance your browsing experience. But, the sad news is, if you have this app on your system, your computer screen will be filled with all kinds of pop-up and banner advertisements, as well as shopping offers every time you go surfing the web. Therefore, this program has been categorized as adware. This means that Jungle Net is a free program that is supported by advertisements. However, this adware has no other real function than showing you third-party ads and get paid by your clicks on them. These ads can be very annoying because they keep disrupting your online activities, sometimes even making browsing impossible and a painful experience. Unfortunately, this is not the worst the presence of this adware can cause you. It is important that you understand the underlying dangers these third-party ads hold. By the end of this article, we hope you will see clearly why we suggest that you remove Jungle Net right now. 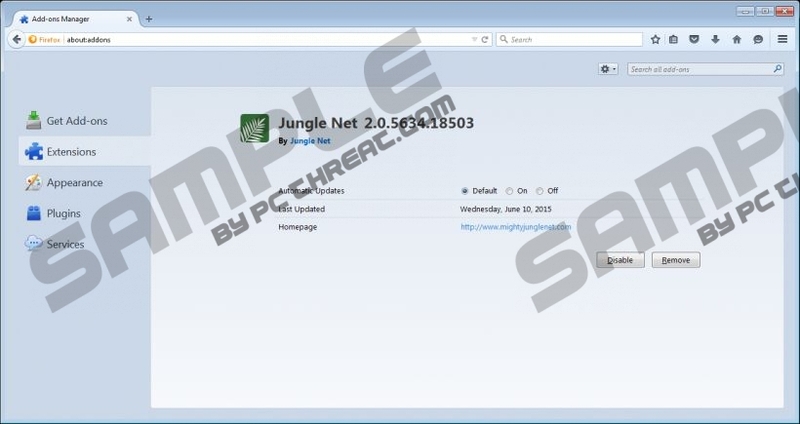 Jungle Net has been found to be a clone of other well-known adware applications, including Deals Avenue, Sale Charger, and Assist Point. They are all built on the Injekt engine and similar to SuperWeb ad-supported apps. This adware has an official-looking website, mightyjunglenet.com, but you cannot really figure out what this application is supposed to do at all. There is only a one-sentence promotion line saying that by using Jungle Net you can “navigate with ease” in the jungle of the web. What makes this adware more questionable and suspicious, though, is that you cannot download it from its own website. Jungle Net is mainly distributed in freeware bundles, which means that it is most likely that you have several more infections on your computer. There are installers created by notorious third-parties who tend to pack adware, browser hijackers, Trojans, and other malware infections together with authentic free software to sneak them onto computers. If you have downloaded and installed such a bundle, it is not enough to delete Jungle Net alone, you also need to scan your system for any other hidden infections. Jungle Net claims to help you “find the best information, deals and options that exist anywhere on the Internet”. However, what it really does is use a variety of technologies to collect information about your browsing habits in order to be able to show you relevant advertisements that match your needs and interests. This may sound like a good idea if you are a frequent online shopper, but you need to know that these targeted third-party ads are not without danger. You might land on infected websites where you might be tricked into downloading fake driver or OS updates, or even reveal your banking details while buying something in a fake online shop. In light of these potential scenarios, we recommend that you remove Jungle Net immediately. The ease of removing this adware is the silver lining here. Fortunately for you, it is as simple as running the uninstaller in Control Panel. If you are not an experienced computer user, you may find our instructions quite helpful. Do not forget that Jungle Net may not be your only worry as there may be other malware infections still hiding on your computer. To take care of those, we would advise you to install a reputable antimalware tool that automatically detects and removes all known threats. If you keep your security tool updated, it will also protect your system from future malicious attacks. Tap Win+X and go to Control Panel. Choose the unwanted application and click Uninstall. Choose the undesirable application in the list and click Uninstall. Quick & tested solution for Jungle Net removal.